I haven't blogged by writing in a long time. Blogging replaced letter writing a while back, but then the reciprical element in a corresepondence is not so direct with blogging and I miss letters. 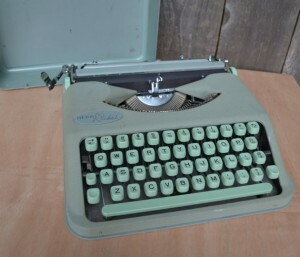 I also miss my Hermes Rocket typewriter. It was so cute. They are for sale on the - guess what - Internet! But I don't need a typewriter when I have an iPad and MacBook Air? But I've been thinking about mail art and artifacts of mail and writing. I weave images and text into my relations with students, fellow faculty, and staff of the school. My communication is layered and I'd like to add animation. I am animated. But animation is not fun to do for me. I wonder about capturing movement as part of a a story/text/illustraion for me? The typewriter was more of a meditation than the computer is. The computer is linked to so many distractions. Sometimes I choose my font to replicate the typewriter's courier and that feels fun and a bit Luddite. I think that the power of Paper53 app on the iPad is that it can capture more of the meditaion of creating. I wonder if there are studies of the tools of creation and the psychological benefits on the artists?